The Incarnation of Jesus Christ certainly fits the criteria of Philippians 4:8: ‘Finally, brothers, whatever is true, whatever is honourable, whatever is just, whatever is pure, whatever is lovely, whatever is commendable, if there is any excellence, if there is anything worthy of praise, think about these things’. God likes us to meditate on his word and his deeds. He knows that our contemplation of them leads to wonder and then to worship. The wonder comes from our inability to fully understand - we don’t wonder about what we understand, we just take those things for granted. When we accept the reality of the Incarnation, even though we fail to understand it, our wonder leads to worship. I love the theology in the carol: ‘Hark the Herald Angels Sing’…‘Veiled in flesh the Godhead see, hail the incarnate deity’; it expresses the wonder and worship we experience as we meditate on the Incarnation. It has often been pointed out that the actual birth of Jesus Christ was perfectly natural; it was his conception that was miraculous. In Luke 1:34-35, Mary doesn’t question the possibility of the conception, but wonders ‘how’ it could happen; she is told enough to leave her wondering and worshipping: ‘The Holy Spirit will come upon you, and the power of the most high will overshadow you, and ,for that reason, the holy offspring shall be called the Son of God’. Joseph, too, was reassured after the conception that ‘that which has been conceived in her is of the Holy Spirit’ (Matt. 1:20). God was Jesus’ father at the level of eternal existence. In Proverbs 30:4, we have a prophetic reference to this eternal relationship: ‘Who has ascended to heaven and come down? Who has gathered the wind in his fists? Who has wrapped up the waters in a garment? Who has established all the ends of the earth? What is his name, and what is his Son’s name? Surely you know!’ Well, we do now: ‘and she shall bear a son, and you shall call His name Jesus, for it is He who will save His people from their sins’ (Matt. 1:21). The Incarnation answers the charge of illegitimacy concerning Jesus Christ. He cited it clearly in his answer to the Jews who levelled that charge against him in John 8:41-42. This infuriated the Jews, and the implications were the main reason that they later sought his death for ‘calling God his own Father, making Himself equal with God’ John 5:18 (cf. John 10:33, 19:7; Luke 22:70). The Incarnation tells us that Jesus Christ is the Son of God come in flesh. Philippians 2:7-8 tells us that he was ‘made in the likeness of men’ and ‘found in appearance as a man’, the distinction being that he was ‘without sin’. He manifested himself in real flesh, but not sinful flesh (cf. 2 Cor. 5:21). In him, God was ‘…sending His own Son in the likeness of sinful flesh and, as an offering for sin, He condemned sin in the flesh’ (Rom. 8:3). We are always theologically educated by meditating on the Word of God (cf. 2 Cor. 8:9). The Bible states the facts without scientific explanation or apologetic. Truth is truth, even if no one believes it. God is not obliged to explain where our limited knowledge and experience restricts our understanding. How could we understand the ‘science’ any more than those living when the Gospels were written? Even today, our most knowledgeable scientists cannot understand the ‘science’. It involves another dimension; as Michael Card put it: ‘Eternity stepped into time’. It is the ultimate arrogance to think that our limited knowledge and experience allow us to understand what took place. It is ignorance of their inability to understand that prompts people to question God’s ability to perform the Incarnation. This is an indication, if you will pardon the pun, of an inadequate conception of who God is. Unbelief based on a misconception of God will ultimately condemn them. Like all miracles, the Incarnation is a sign to reassure the believer and condemn the unbeliever: ‘Whoever believes in him is not condemned, but whoever does not believe is condemned already, because he has not believed in the name of the only Son of God’ (John 3.18). The Incarnation is the answer to those who complain that, if there is a God, why doesn’t he come and tell us? 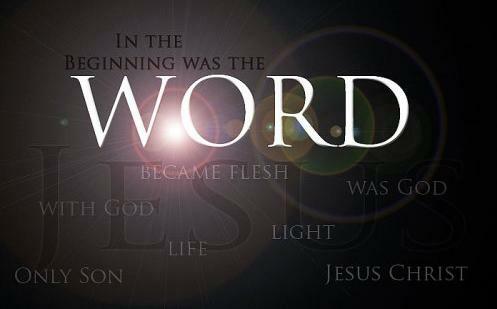 He ‘became flesh and dwelt among us’. God, in Christ, invaded our personal space and, in radical transparency, took on the limitations of human life. By laying aside his glory, God became as close to us as is metaphysically possible (Phil. 2:7). As we often sing, He ‘laid aside His majesty’ and ‘entered our world His glory veiled’. He restricted himself to time and space to give us the opportunity to dwell with him in eternity. God knows that wonder is good for us, and urges us to ‘consider Jesus’, because ‘in these last days He has spoken to us in His Son’ (Heb.1:2). As Michael card sings: ‘His final word was “Jesus”, he needed no other one’. The Word who became Flesh and dwelt among us, and who is ‘the only begotten from the Father’, is the ‘Word incarnate, truth revealing’. In Rom. 8:24, Paul shows the connection between faith and hope: ‘hope that is seen is not hope, for why does one hope for what he sees’. God redirects our thinking from ourselves to Jesus, to lead us to worship and give us hope. Let us ponder and wonder, then worship ‘Christ Jesus, who is our hope’ (1 Tim. 1:1). About Ivor: Ivor Anderson is a member of the Newcastle Church. He completed his BD and MTh through IBC in the 1990s. He is a teacher in Shimna College, Newcastle.